The QuickFlics app was conceived of by a mom for moms – and for Dads, Grandparents, and anyone who takes video by phone and wants to preserve and organize memories with physical copies. How many videos do you shoot on your phone each month? What do you do with them? Most of us just leave our videos on our phones or send them to linger in the cloud. What’s the point of capturing your special moments if you never free them? 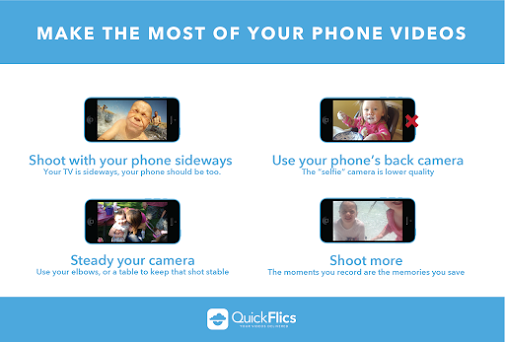 QuickFlics allows you to save and share your videos from your smartphone to a DVD. Just select which videos you want on DVD, and the QuickFlics app will do the rest. For just $7.99 a month (including shipping and processing), QuickFlics will send you a DVD copy of all your uploaded videos. Every month. You can even order additional copies of your month’s videos and ship them to friends and family through the app. Each additional DVD only costs $4.99 to send (including shipping and processing). QuickFlics... your videos delivered, each month. will get 50% off their first DVD order!! The app is really easy to use and you are only charged when you order a DVD!! What a great way to share those moments with out having to pass your phone around. You get a DVD that you can play on your TV and let everyone see! Your DVD will arrive within one week. Quickflics is the perfect solution to organizing and watching your mobile videos, and the perfect gift for grandparent, relatives and friends. You will be able to enjoy your videos for years!